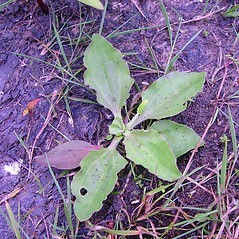 Many-seeded plantain is a common native plantain of the coastal plain. It inhabits rock and gravel beaches, headlands, upper edges of salt and brackish marshes, and other open areas near the coast. 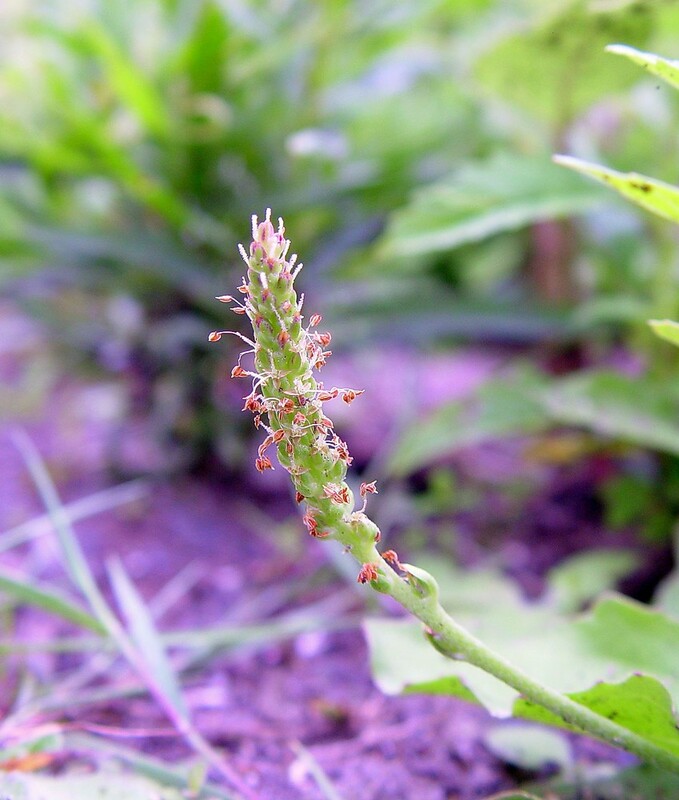 It closely resembles the more common Plantago major except that its leaves tend to be more sandpapery, hairy, and narrow, and the tiny fruits have a rounded rather than pointy top. 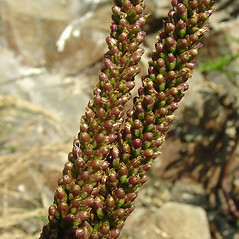 pyxis rounded to pointed at the apex, containing mostly 6–11 seeds, and leaf blades membranaceous to fleshy-herbaceous, glabrous or pubescent, broad-elliptic to broad-ovate, borne on relatively more elongate and slender petioles (vs. P. intermedia, with the pyxis broadly rounded at the apex, containing mostly 14–22 seeds, and leaf blades subcoriaceous-fleshy, usually pubescent, narrow-elliptic to ovate, borne on broad, short petioles). 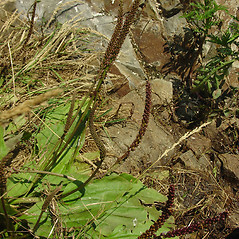 pyxis mostly 4–6 mm tall, circumscissile near the base, containing mostly 4–9 seeds, bracts narrow-triangular, and seeds mostly 1.5–2 mm long, not reticulate-patterned (vs. P. intermedia, with the pyxis mostly 2.5–4 mm tall, circumscissile near the middle, containing mostly 14–22 seeds, bracts broad-ovate, and seeds 1–1.7 mm long, reticulate-patterned). 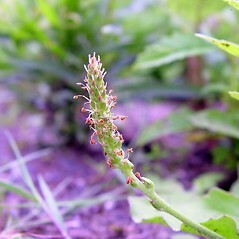 Plantago major L. ssp. intermedia (DC.) Arcang. 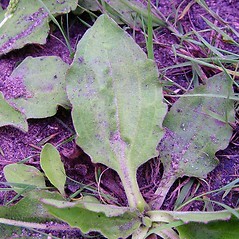 many-seeded plantain. 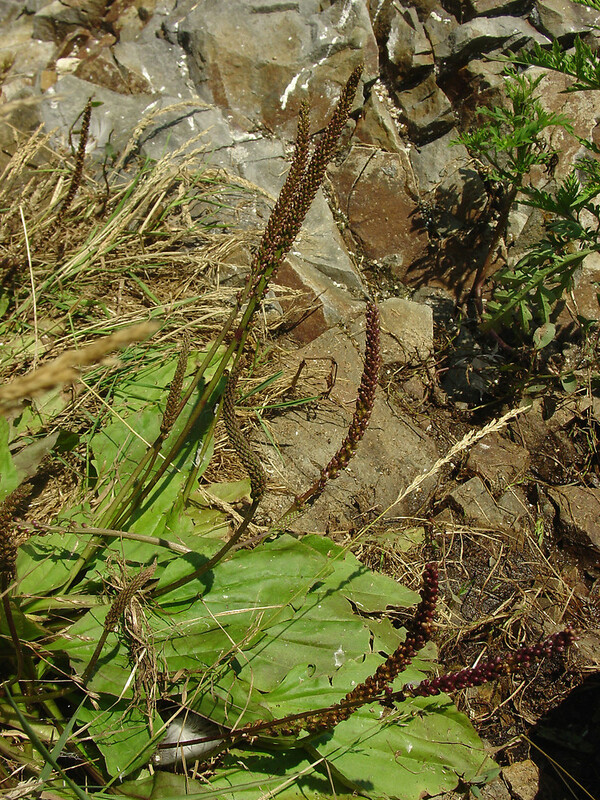 Plantago halophila Bickn. ; P. major L. ssp. intermedia (DC.) Arcang. 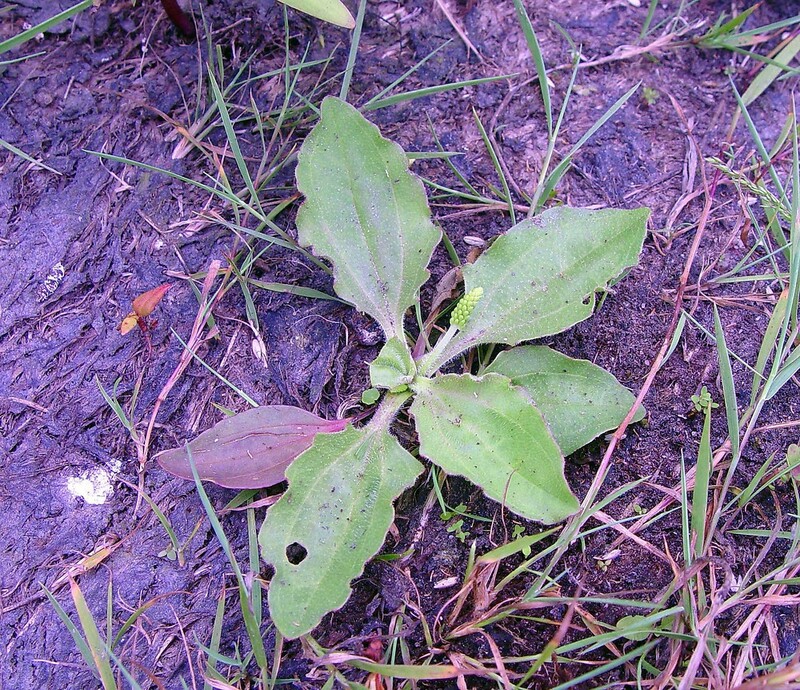 ; P. major var. intermedia (DC.) Pilger; P. major L. ssp. 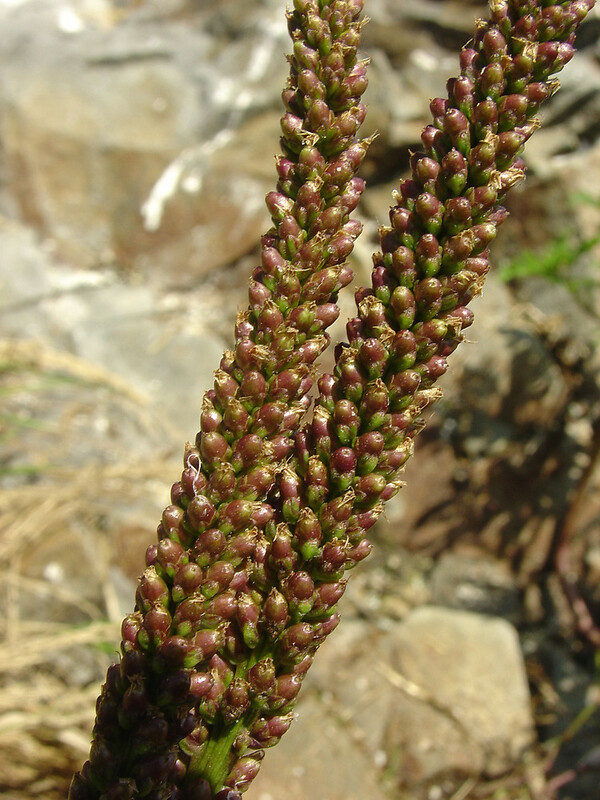 pleiosperma Pilger; P. major var. 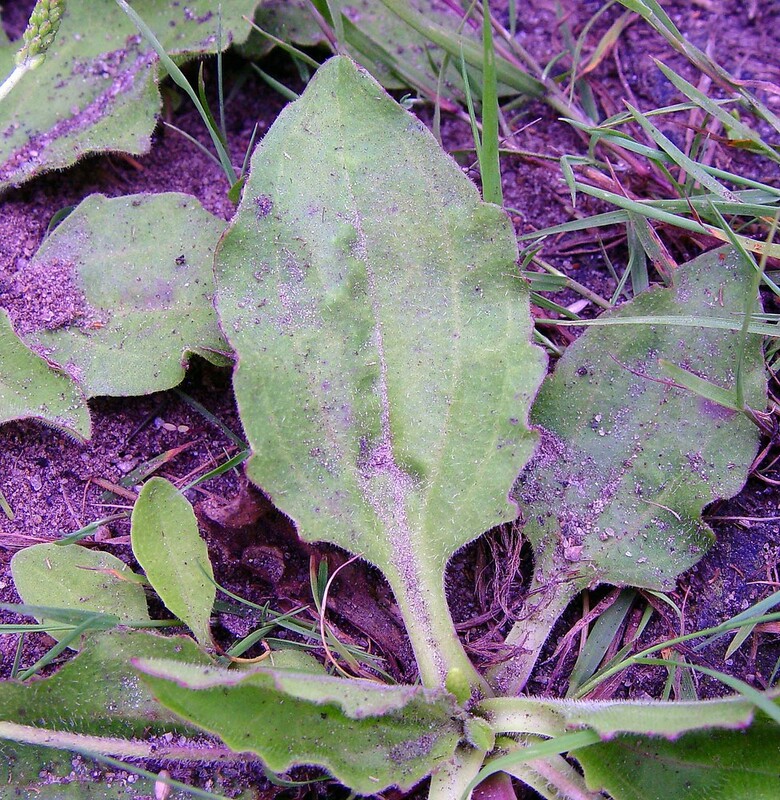 scopulorum Fries & Broberg • CT, MA, ME, NH, RI; coastal plain. Open areas near or adjacent to the Atlantic coast, included rocky or gravelly beaches, headlands, and upper edges of saline to brackish marshes.